Welcome to Deadly Designs! I’m Markus, a programmer, amateur game designer, and major Magic fan. I’m hoping that I can help open up a window into the underlying machinery behind what makes a card, a limited environment, or a format, as well as the interesting questions behind understanding what cards do to how we play. As a brief aside, I want to mention to anyone reading that any card designs will always be hosted on external sites and only linked to here. I don't expect any members of R&D to necessarily read this, but I like that option being open, and also I think it'd be rude of me to post content that could lead to Wizards people potentially avoiding other blog posts on here purely because I feel like sharing. For our first segment, I think it’s important to touch on a subject almost every enfranchised player has an opinion on: Modern. As the most competitive nonrotating format you can get into for less than the cost of a decent used car, Modern attracts a lot of players, and designs specifically keyed in towards Modern are starting to come out of the woodwork. I'm no fortune teller, especially since the spoiler for a certain black green rare already happened, but I expect we can see a Fatal Push level card every year or so for Modern in the near future. In that context, I think it’s a good idea to talk about the major elements of Modern from the perspective of designing cards that’re dedicated to slot into Modern. Pop Quiz, what do these three cards have in common? They’re all mainboard sideboard cards. For sake of this conversation, let’s define a ‘mainboard sideboard’ card as ‘a card that generally justifies its own existence in the mainboard, but has extra text that acts like a sideboard card in certain matchups.’ Explosives invalidates token strategies and wide creature decks with a lot of shared converted mana costs while also being a valid combo piece and a way to fight through hate for KCI. Cavern fixes your mana while blanking countermagic not named Cryptic Command. Brutality 3 for 1s Burn where otherwise you’d die with cards in hand, and is also either a removal spell or a Duress depending on your needs. Some level of mainboard sideboard effect is inevitable, some cards are just better against some kinds of decks than others, but in Modern these effects can often be much louder. To some extent, the existence of mainboard sideboard cards can be very good; drawing a Scavenging Ooze can turn an awful matchup into a fun subgame around lifegain, getting Scooze too big to be bolted, or eating the right graveyard cards with however much green mana you have in one or two turn cycles. In the same vein, a Dredge or Company deck can have a subgame built entirely out of deciding how much to respect the risk of an opposing Anger of the Gods. For the most part, players like games and subgames and dislike non-games, with the occasional exception of some rare and impressive combo non-games that’re so fast and so powerful they become an event unto themselves. That said, there are substantial downsides to the existence of mainboard sideboard cards in certain settings. Matchups where the deck getting a mainboard sideboard card was already favored, or where the mainboard sideboard card is so powerful it kills the opposing deck entirely, can be supremely unfun. The strongest mainboard sideboard cards tend to be quite frustrating for players specifically because they’re so good at invalidating strategies. Modern already has frustrating sideboard nukes, so when those can sneak into a game one it often feels overwhelmingly bad. Worse, these cards can warp the effects that see play in a way that can bias designs negatively. We already saw this in Standard with the creation of Thragtusk and Cavern of Souls as mainboardable hate against Snapcaster Mage and Delver of Secrets. Big Daddy Tusk spawned an annoyingly prominent Standard deck, but the risk for Modern is similarly dangerous. If you design countermagic around the fact that it will be borderline useless in a random chunk of matches due to Cavern, it runs the risk of designing counterspells powerful enough to force Cavern decks further up. If you design burn spells to be good enough to have a serious game after a Collective Brutality, it often forces you to create burn spells that hurt the non-Brutality decks. Designing cards around the prominence of another warping card tends to only put more emphasis on the card to which you're reacting. The question, then, is how do you design around these cards? I wish I had an easy answer to give here. For at least some of these cards, like Collective Brutality, the card isn’t necessarily an automatic include in the deck in any volume, and you can indirectly affect its presence. If you upgrade a deck that Brutality is mediocre against, Jund might run fewer copies, which helps Burn. Obviously, this sort of subtle tuning is hard to correctly predict when the cardboard hits the table, but at least in theory it’s possible to deflate a card like that if it sees too much play. For cards like Engineered Explosives in KCI and Cavern and Aether Vial in Humans it’s a whole different question. For those decks, the mainboard sideboard text on the card is virtually free, because it contributes to their main gameplan. Humans would never say no to another Unclaimed Territory effect, and KCI needs 0 cmc artifacts, so these cards slot in as 4-ofs. Sadly, here I honestly don’t know the answer. If a deck automatically runs 4 copies of a card that invalidates whole strategies, should designers be working to reduce that decks metagame share? Should we print cards that work to attack the decks that play those mainboard sideboard cards, even if they aren't specifically built around attacking one problem card, or does that run the risk of printing the Modern equivalent of a Thragtusk? Delve is anti-linear with itself; you want to run as few Delve cards as possible because they end up competing with one another for resources, but whatever Delve cards you have in your deck put a lot of pressure on you to get cards into your graveyard quickly. That means most Delve decks run some combination of fast cantrips and self-mill. Most cost reduction mechanics in Modern do a similar sort of maximization. Regardless of whether you’re casting Dangler, Hollow One, or Bedlam Reveler, you’re maximizing for a cost reduction mechanic. The strange thing is that the sideboard cards against these somewhat linear cost reduction strategies don’t actually attack the mechanic directly. The most common hate card against this sort of strategy is Rest in Peace. 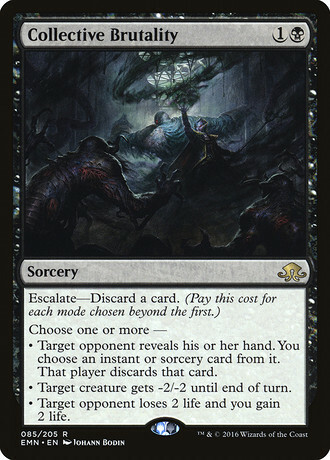 The bulk of cost reduction cards recently introduced to Modern share some element of graveyard dependance. A player can’t hit cost reduction directly, so most often they hit graveyards because most cost reduction strategies in Modern are also graveyard strategies. This has the side effect of meaning that there are good odds that whatever you use to trap their Gurmag Angler in hand also happens to blank traditional Dredge strategies, or other incidental graveyard cards like Tarmogoyf and Kitchen Finks. Similarly, Humans is the dominant aggro deck in the format, but there’s no real tribal hate in Modern. Everything used to attack Humans in decks tends to incidentally attack other creature strategies. Terminus, Wraths and Paths all make dudes just as dead regardless of creature type. Unline a deck like Affinity, the fundamental element of Humans that gives it synergy has nothing in Modern that punishes that synergy. Engineered Plague isn’t a strong enough effect for attacking tribal decks in this way, but in concept it’s not too far off. There are two broad reasons why this is a useful sort of hole to fill with freshly designed cards. First, existing hate can have the side effect of deflating strategies that aren’t a large chunk of the metagame. If there's no more efficient way to fight Humans than packing a bunch of removal, then all the other creature decks get punished by association. Second, being able to narrowly attack certain types of mechanics in different ways is useful. If you could attack cost reduction mechanics, it might be possible to have a board card that hurts Gurmag Angler, Chord of Calling, and Thoughtcast equally. Obviously that third one would require your opponent to be playing Thoughtcast, but still. Similarly, if you could do something that was the opposite of Arcane Adaptation, you might be able to hit Eldrazi Temple and Champion of the Parish with the same card. These sorts of sideboard cards tend to be able to be role players that hit multiple decks in new ways, and ask compelling questions to a player about what they expect to face. When one of these is printed, it turns the process of choosing your fifteen sideboard cards a new experience all over again. Off the top of my head, here’s a short list of mechanics that aren’t really hateable on their own at the moment: triggered abilities, cost reduction mechanics, tribes, replacement effects, manlands and other utility lands, planeswalkers, and keyword abilities. Not all of these are prominent right now in Modern the the two I highlighted are, but they're all at least worth considering. Two weeks ago, there was a subsection of the draft of this article that I had written up about how it's almost impossible to have a mainboard card that both stops your opponent assembling Tron and justifies its own existence in other matchups, and therefore that most Tron matchups tended to be just a check against your opponent’s game 1 strategy and the existence of a small handful of sideboard cards that’re mostly too narrow to do anything in any other matchup. That’s a bad play pattern, because it mostly means the matchup is a race between whatever deck is trying to punch Tron to death and Tron assembling Tron, followed by a game where they do the same thing but with maybe one or two sideboard cards seen by either player. Then, Assassin’s Trophy came along and addressed exactly that criticism. Now, fair midrange decks have a mainboardable card that slows Tron by at least 1-2 turns. It’s likely still not a favorable matchup preboard, but at least now most black green decks have access to a way to keep from being decimated immediately. I’m uncertain how much Tron can survive in an environment where other decks have a mainboard way to do things against them, but it’s a very interesting question to be asking. 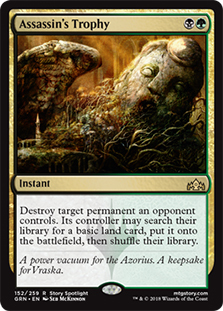 Ironically, we can note here that this is arguably itself a mainboard sideboard card for decks like Jund against Tron, but the follow-up question to that is ‘should worthwhile land hate before turn 3 be a sideboard effect in Modern?’ I think that Trophy is a good test case for answering that. Join me next time, where I talk about one of my favorite types of design in all of magic: Modal spells. Ethan Saks goes over the characteristics of great limited formats. What kinds of cards contribute to gameplay rich with options? Ted talks about some changes to Trading Posts, recent and upcoming development, and community news.